Two people I'd never heard of came into the public domain yesterday. One was Jim Harra, Tax Assurance Commissioner and Director General Customer Strategy and Tax Design, HMRC. The other was Bill Williamson, Customs Director, HMRC. 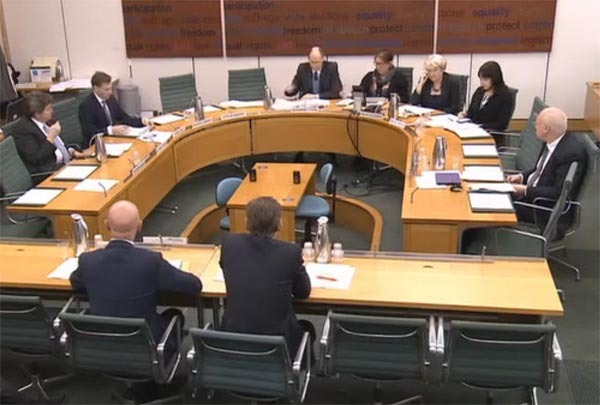 Both were giving evidence the Treasury Committee inquiry on the UK's future economic relationship with the EU. Their evidence was televised and can be seen here. A transcript will follow, but I've taken some rough notes of my own. The chair Andrew Tyrie started off the session with a question about Mrs May's "walk away" option which would have us relying on WTO rules for our trade arrangements. "Are you confident we can handle it? ", Tyrie asked. Harra did most of the talking, his immediate offering being that we (the Customs Service) "are preparing for that contingency, so that we are ready for that". It would be a significant change, said Harra, adding, "it is not an outcome that we would expect". He referred to the EU's Union Customs Code (UCC) and told Tyrie that, as we scope the "day-one model", where we've left the EU and are operating under those WTO rules, "we will be looking to see whether we can keep that as close as possible to the UCC that everyone's familiar with". Pressed further as to where the Service stood, Harra – in a classic example of civil service obfuscation – assured us that "we" (the Service again) "certainly believe that we can implement a model on day one that will enable trade to continue". This, is about as clear as it gets: "we believe". This is the Customs Service and the best its top honcho can offer about future operations is a belief. But, to add to his concern that it is not an expected outcome, we also get learn that the WTO option is "not the most desirable outcome". This, Harra says, "is to have an arrangement that gives us more than that". The WTO option would mean a significant increase, for example, in the number of customs declarations and that would add additional cost both for us to administer and for businesses to administer it. Then we get a highly conditional statement. If we could base the new system "on existing arrangements", we believe - there's that word "believe" again - "that's something we could get in place in the time". But then we get a "but" - "but we are in the process of scoping both what would be required and the costs". Whether we could base the system "on existing arrangements" is pure conjecture. It's that word "scoping" that gives it away. It's that which says that they really don't have a clue. And just so that there was no doubt, Harra said it again: "We're still scoping a 'day-one scenario' in the event of no agreement". Around this point Jacob Rees-Mogg intervened with a hypothetical question, asking whether we could adopt "a very light touch" on everybody exporting to the UK. Bill Williamson took this one, agreeing with the Mogg: "That would be entirely up to us". What then happened was the event that actually brought this inquiry to our notice – a tweet by Mogg's crony, Steve Baker – misrepresenting the case in a way that strikes hard at his objectivity and competence. "Director confident", Baker tweets: "trade will flow smoothly at border post-Brexit: 96% electronic clearance in seconds with no intervention". There is no doubt what impression Baker wanted to give, but this is what Williamson actually said: It's probably worth saying to the Committee that … 96 percent of all customs declarations are cleared within seconds without any intervention from us and that's an approach we would of course want to continue in any new customs system". Deconstructing this, we're looking here at motherhood and apple pie - of course Williamson wants this approach to continue. Who wouldn't? Under the current system, 96 percent of non-EU goods are cleared electronically and cleared in seconds: it would be just peachy if this also applied to goods from EU Member States. Williamson went on to say was that it'll be for the UK to decide what resources it wants to deploy, on a risk assessment basis. And as this was talked through, the Committee heard that this would depend on how much information was coming through the system. Mogg, taking a wildly optimistic view, suggested that we could get more than we are at present. As likely, we could end up getting considerably less information. The term "risk assessment", however, sailed over this facile little man's head. Yet, if we walk away from a deal, the UK ceases to be an EU Member State and crashes into its new "third country" status, invisible in EU databases and without a track record that enables a risk assessment to be made. On the basis of existing EU systems, our traders drop into the high risk category, port inspections multiply and the system grinds to a halt. And this is where it's getting surreal. The Tory Right so badly wants its "clean Brexit" that it's prepared to ditch any sense of objectivity and honesty. What we saw of this session is that everybody was looking in the opposite direction – the wrong direction. This isn't about the as yet "unscoped" response of the UK Customs Service. It is about how the EU in all its manifestations will respond. Confronted with the concerns of industry representatives over the damaging effects of a "hard" Brexit, Jim Harra picked up the ball and ran with it. "We can't guarantee that there won't be any changes but we will aim to keep any disruption to a minimum", said Harra. "There's still uncertainty [but] it's our determination that it [Dover] will not grind to a halt". But – and it's another but – this is on a wing and a prayer, a belief system with no substance, no different from the insane, childish belief of the Tory Right that everything will be alright on the night. Negotiations have not begun with anyone, Harra says. There haven't even been any discussions at officer level and no one has the faintest idea what the outcome might be. Yet, we are told, "Everything depends on the negotiations at EU level". And indeed it does, the very negotiations which Mrs May in her cavalier way is so prepared to abandon. And there are no guarantees. To suggest that things are under control, that we can have any confidence in this government's handling of negotiations, is rampant delusion. We are being treated to mushroom management and a level of casual stupidity that we rarely experience in UK politics. We have senior politicians, supposedly experienced people, reducing one of the most important events of this century to the level of theatrical bartering in a souk over the price of a carpet, driven by ignorance and a supercilious disdain for the well-found fears of knowledgeable and diligent people. This is the politics of contempt. But while those in power have power, nothing lasts for ever – and especially not patience with administrative incompetence that threatens to destroy the economy of this country. And when they are on their way down, those who have so easily treated us with contempt will soon learn that it is a two-edged sword.